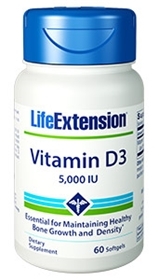 Vitamin D is synthesized in the body from sunlight. But, due to the winter season, weather conditions, and sunscreen blockers, the body’s ability to produce optimal vitamin D levels may be inhibited. In fact, it has been proposed that annual fluctuations in vitamin D levels explain the seasonality of influenza. All of these factors point to the value of taking a daily vitamin D supplement to ensure optimal vitamin D intake. Vitamin D has long provided significant support for healthy bone density. However, scientists have also validated the critical role that vitamin D plays in regulating healthy cell division and differentiation, and its profound effects on human immunity. These findings link a deficiency of vitamin D to a host of common age-related problems. The current RDA is only 400 IU. As a result of startling evidence of a widespread vitamin D deficiency, prominent nutritional scientists are calling on Americans to increase their vitamin D intake to 1000 IU per day and higher. Currently, most experts in the field believe that intakes of between 1000 and 4000 IU for adults will lead to a more healthy level of serum 25(OH)D, at approximately 75 nmol/L. Life Extension recommends that healthy adults supplement each day with at least 1000 IU of vitamin D. Elderly adults may benefit from higher doses such as 2000 IU daily, and even up to 5000 IU daily. Other ingredients: dicalcium phosphate, magnesium stearate, silica. Take one capsule daily with a fat containing, low fiber meal, or as recommended by a healthcare practitioner.